Yes, all of our events are ‘self-drive’ experiences for two persons and there are no instructors. We’ve designed some incredible driving routes for you and your partner to enjoy in many different regional destinations. Will I be able to share the drive with my partner? We entice all our customers to slip behind the wheel and provide almost equivalent opportunities for each couple or pair to share the drive throughout the journey. Of course, the decision is completely yours to decide during the event. Do I need to have a manual driver licence? No, all of our supercars are ‘semi-automatic’ in the sense that they are equipped with a ‘paddle-shift’ mechanism rather than a traditional ‘H-pattern’ manual transmission. There is a clutch and sometimes two, but no physical clutch pedal; the car handles this entire operation and you simply ‘flick’ a paddle to change gear. It’s easy. Can I drive or attend if I am pregnant? Yes, providing you’re not over 26 weeks into your pregnancy. Do you guarantee the new Ferrari and Lamborghini? Yes, the new Ferrari 488 GTB and Lamborghini Huracán LP 610-4 are definitely included as part of our stable of different supercars. What other supercars are included? Considering that we guarantee the inclusion of a brand new Ferrari 488 GTB and Lamborghini Huracán LP 610-4, the complete stable for each event will always remain a surprise until the day. This ensures that we have the flexibility to continually purchase new supercars when convenient throughout the year from a range of marques such as McLaren, Maserati, Aston Martin just to name a few. Is a security deposit or bond required? No, it’s not in our interest to ask our customers for a security deposit or bond – it’s simply not our style. Do you provide comprehensive insurance? Yes, comprehensive vehicle insurance is included on the provision that a maximum ‘at-fault’ insurance-excess of A$10k applies to the driver. This may be halved to A$5k via an upgrade of A$220, however it cannot be completely waived. Have you ever had to use your insurance policy? We have never had to use our insurance policy and have achieved a remarkable safety record of not having a single incident, having entertained thousands of customers during our 10+ year history. The drives are ‘spirited’, but your experience is never rushed. Eligible drivers must be at least 25 years of age and in possession of a valid and complete driver licence that has been held for at least 3 years. The minimum age for a ‘non-driving’ passenger is 12 years. Do you provide set-menu options? Dining is an important element of our experiences and we provide the greatest range of choice at each restaurant; so no ‘set-menus’. Do you cater for guests with specific dietary requirements? Absolutely. Whether you’re intolerant to a particular ingredient or simply have a preference for a particular style of dining, we choose restaurants that cater for almost all dietary requirements. Just let us know and we’ll communicate this directly with the restaurant. Can I invite others to join for lunch/dinner? Yes, please let us know if you wish to invite others to join for lunch or dinner and we’ll do our best to accommodate your request. You’re welcome to pay via debit, credit-card or bank transfer. We only require an initial 20% deposit and there are no surcharge fees for using VISA, MasterCard or American Express – we simply absorb them for greater convenience. Yes. You can opt to finalise the remaining balance via instalments on either a weekly, fortnightly, monthly or quarterly basis. This can be automated for you via our secure payment gateway on a preferred debit or credit-card, or you can transfer via direct-deposit. Can I purchase a gift-certificate? Yes, we can create personalised gift-certificates that may be ‘open-dated’ and valid for at least 12 months, or you’re welcome to pre-select an experience for the recipient. Each gift-certificate is individually tailored and can be emailed as a ‘high-resolution’ PDF so that you have it immediately. Do you honour gift-certificates beyond 12-months? Yes. If for any reason you’re unable to redeem the gift-certificate within 12-months, its value may be transferred towards any of our experiences across Australia. It’s rare that someone would wait that long but we’ll always be as flexible as possible for you. We’re extremely flexible and understand that sometimes things happen unexpectedly and you may need to re-schedule your event. We’ll always provide you with at least a further 12-months to select another date or experience; we simply ask for as much notice as possible should you wish to cancel and re-schedule your event. Complete payment is required to transfer or amend all reservations within 14 days of your scheduled event. What happens if it rains or poor weather conditions are forecasted? We carefully select the seasons that offer the most temperate and ideal conditions for driving at each location across Australia. If rain or adverse weather conditions are forecasted, we generally aim to provide as much notice as reasonably possible should a decision be made to postpone an event in the interests of safety. It’s certainly more fun in the dry! Should I book flights with a flexible cancellation policy? Yes, this provides you with more flexibility just in case you need to change a date, for whatever reason. We’ll try to provide as much notice as reasonably possible should we need to re-schedule or postpone an event due to adverse weather conditions. Do you provide a professional photographer? 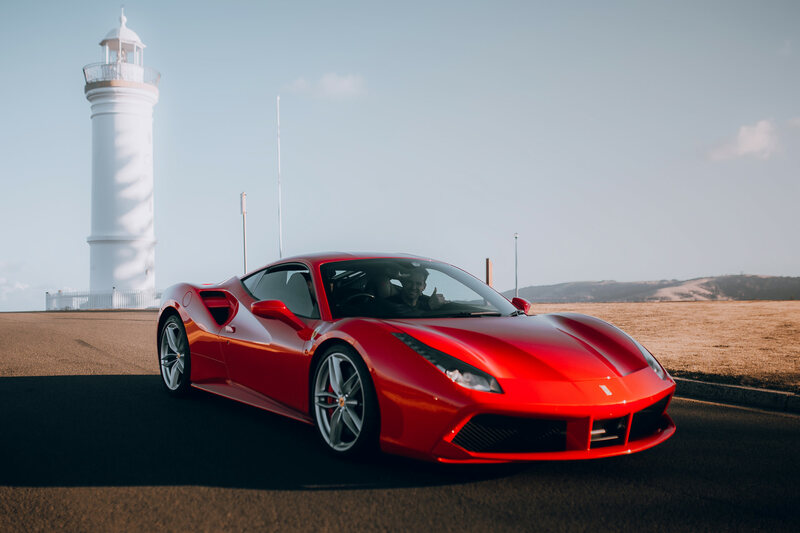 Yes, pro-photographer Erik Rosenberg has partnered with Prancing Horse to capture everything from incredible natural portraits of you and your partner, stunning landscapes and driving shots during your experience. An amazing lifestyle and wedding photographer, Erik’s work is often displayed throughout our website and social channels. Yes. You’re welcome to pre-book the professional photography package during the reservation process or before your scheduled event. Can I also use my own camera? Absolutely. We’ll go to great lengths to help you capture some fantastic shots at numerous scenic locations along the way.